Overton was charged this week with providing alcohol to two 16-year-old girls. One of the girls alleged he sexually assaulted her, but he wasn't charged with that crime due to conflicting witness testimony. Romar suspended Overton for this week's Pac-10 Tournament. But Overton will play in the NCAA Tournament, if UW makes it there. KPLU sports commentator Art Thiel says he is willing to give Romar the benefit of the doubt on a very difficult decision. But he says it doesn't dismiss what he calls Overton's "dastardly, dumb act." "His act of selfishness compromised not only himself - he damaged a young 16-year-old, he put his team in jeopardy in terms of their distracted play. And now Romar has an opportunity has a tough guy by throwing him away (kicking him off the team)...but Romar believes, after four years with this kid, that if there's something redeemable about him, this is the way to get at it." 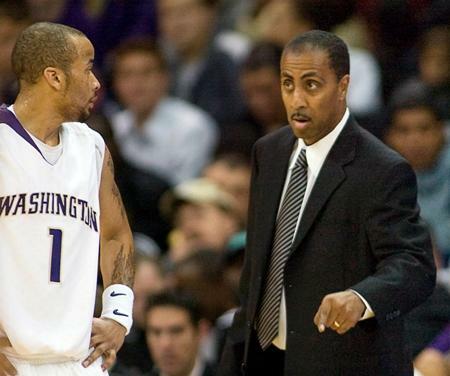 After observing Romar for the past nine years, Art sees him as a man of conscience who cares more about his players' futures off the court than wins and losses on the court. "Romar will risk the criticism and even condemnation of those people who think that this kid (Overton) should be abandoned immediately." Art says, as someone who grew up in Compton, California, and knows a lot about street life, Romar thinks that abandonment is a very serious issue for a lot of kids. "He doesn't want to throw Overton away until Overton absolutely rejects whatever Romar is offering him. And that hasn't happened yet. So, he wants to see if that bond can be repaired and there's some way that Overton can turn around his life and be productive." Art says Overton is not going to be an NBA player - he says he doesn't have that kind of talent. According to Art, this about Overton the human being and not Overton the player.